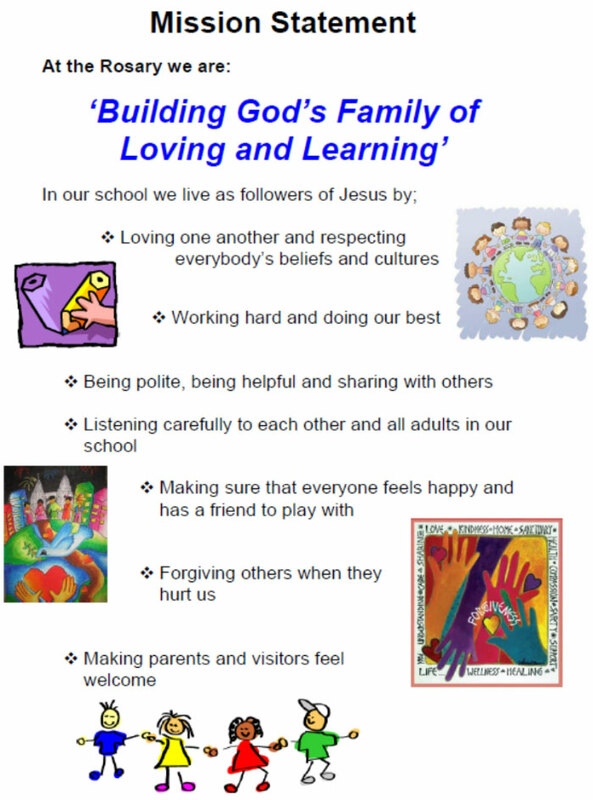 To be a Christian community where the spirit of Christ pervades all aspects of school life. Uniting its staff, pupils and parents/carers, whilst demonstrating an understanding of other races, religions and ways of life. To lead each child to a greater understanding of the love of God our Father through the teachings of Jesus Christ. To help and guide every child on his/her personal journey in faith. 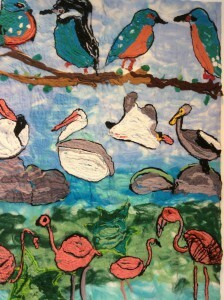 To promote a safe, caring and supportive ethos which builds each child’s self-esteem. To strive for academic excellence and the fulfilment of each child’s individual potential. To offer a broad and balanced curriculum on which to build a firm foundation for their whole educational experience. 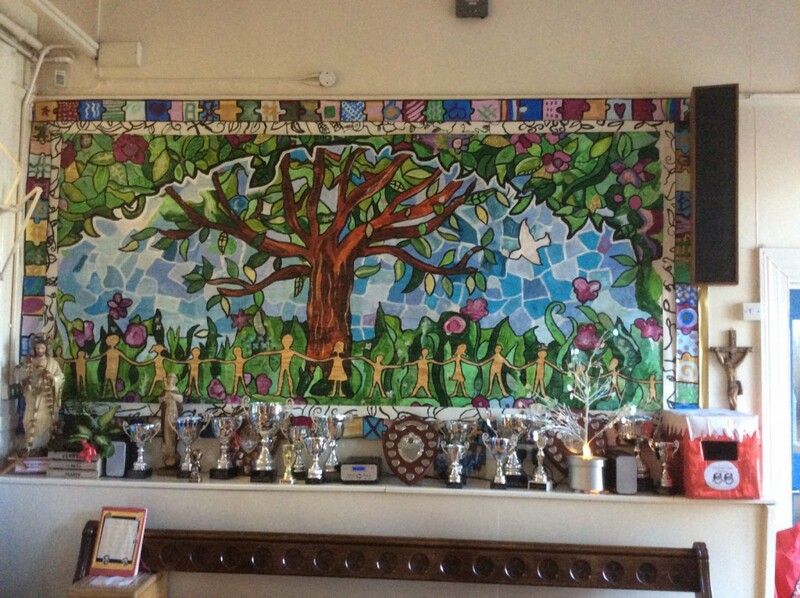 Prayer and worship are at the heart of our school. 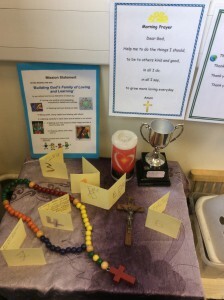 The children have many opportunities for worship including daily class worship, independent, child led worship which is planned and organised by pupils, worship activities during the lunch hour in Our Lady’s garden led by our school pupil chaplaincy group. The school day begins and ends with morning and evening prayers. This is held in the classrooms with all classed based staff and pupils involved. It is a beautiful way of coming together at the start and end of the day. 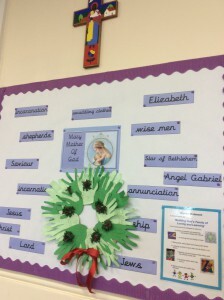 Staff and pupils lead this and often ask for special prayers to be said or people remembered. All children understand that they can ask for a personal intention and can compile and share their own prayers. Grace before meals is said in every class before lunch play. Children are encouraged to develop a forgiving nature and to pray for those who have offended them. Teaching assistants have had training in restorative justice and can lead and guide on this important aspect of spiritual development. 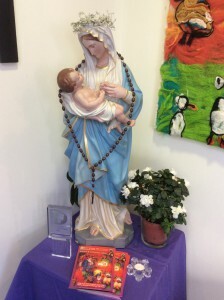 Prayer life is an integral part of the school with displays, statues, other religious symbols and focus areas both inside and outside the school building. This includes Our Lady’s Garden and St Francis’s Square. Pupils are reflective during prayer and value opportunities to be still and quiet. They are active and enthusiastic in the preparation and reading of their own prayers. 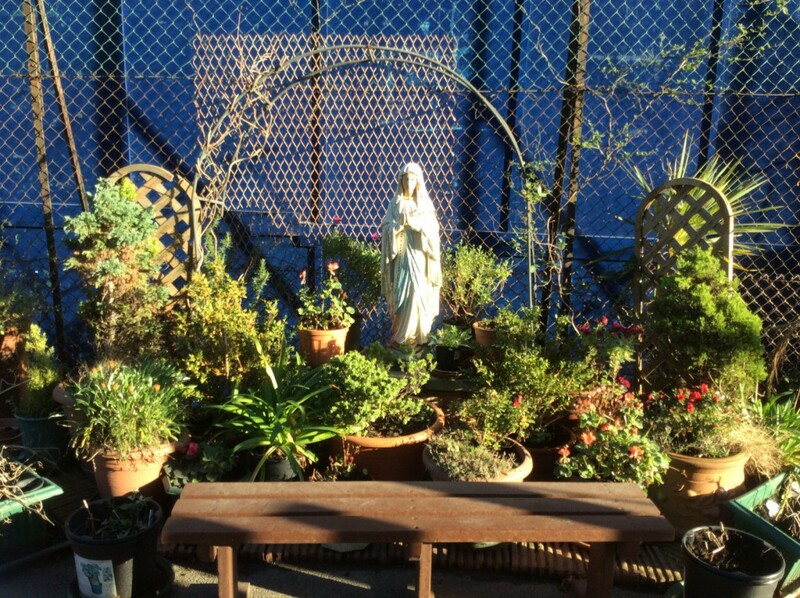 Our Lady is pivotal in devotions across the school. We say the Rosary, celebrate the feast of the Rosary and have devotion to Mary during October and May. During Lent children are led in contemplation of the Stations of the Cross by a member of the parish community. Sacred music is used every day to ensure a calm and contemplative school atmosphere and to complement and enrich collective worship. Different members of the school community plan and lead the assemblies: The senior leadership team, teachers, or classes. Our termly class assemblies actively involve parents. Visitors are warmly welcomed such as clergy from the different parishes we serve, parents and representatives of the various charities the school supports. The children are joyful and enthusiastic about leading class assemblies. Celebrations are often based on ‘The Way the Truth and the Life’ using issues of relevance to the children. Prayer focuses change regularly to reflect the Liturgical year and’ the Way the Truth and the Life’ topic. The celebration of the Eucharist on Feast Days, at the start and end of the school year and during the key seasons of the Liturgical year such as Advent and Lent take place in the main school hall. We also have services of Reconciliation, Exposition of the Blessed Sacrament, Stations of the Cross and the Rosary. Children lead these celebrations and services and are always prayerful and respectful. Parents and friends of the school are warmly welcomed to join with our community on these very special occasions. The whole school community has a clear understanding of their call to service through the example and teachings of Jesus Christ Our Lord. Older children have links with children in younger classes where the emphasis is on helping, caring and sharing. The playground Squad serves the whole school community and strives to ensure that friendships are nurtured and relationships in the playground are good. The Sustainers ensure that we care for the wonderful environment we have, recycling where possible and ensuring that we preserve precious resources such as gas, electricity and water. School Councillors serve the whole school community, representing their needs and views about all aspects of school life to support the common good and develop their leadership skills. We support a wide variety of global, diocesan and Catholic charities. The curriculum is well planned for children to explore famous ‘Peace Makers’ and courageous leaders including work during Black History month. We follow the UN ‘Rights Respecting Schools’ principles and the children are instrumental in drawing up their own class charters. Pupils demonstrate respect for each other’s cultural background by regularly celebrating our many cultures through themed events such as language of the term and culturally based assemblies. Pupils have a deep understanding of the ‘Common Good’ and are fully aware of what we do in the local, wider and global community but, more importantly, they understand why we do this. 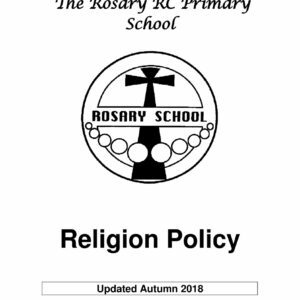 Community cohesion is a core value and ethics and cultural diversity have always been a rich feature of the Rosary school. Other religions are taught at the school and diversity is celebrated through cultural assemblies. We challenge children to see God’s presence in our neighbours, especially those who are suffering or struggling. We actively engage in a range of activities to support those in need by supporting different charities. Chamber Choir visit and sing for the elderly, Carol singing to raise awareness and funds for the homeless and collecting food at Harvest time for ‘The Passage’. Pupils have a sound understanding of how our fundraising activities help us answer the call to serve and this is developed through assemblies and lessons. We teach children to be true to themselves and appreciate that everyone is different and beautiful in the eyes of God. School Councillors take an active role in helping their peers understand the call to service. The Fundraising Committee help others by organising activities and reporting to pupils the latest fundraising and community activities. We follow the RE scheme ‘The Way the Truth and the Life’ and teachers endeavour to ensure that the Gospel values and the principles of the ‘Common Good ’are integrated into all aspects of the curriculum especially English, history, geography, science and PSHE and Citizenship. It prepares the pupils in our Catholic schools for life in modern Britain, giving them an understanding of the beliefs of others. This in turn will improve social cohesion and contribute to the common good by increasing mutual respect between those of different religions. Partnership is key and a vital part of the school’s understanding of our mission and purpose both within the school and the wider community. Parents are genuinely and warmly welcomed to join with us and participate in ceremonies, activities and wider projects at various times throughout the year. We constantly seek ways to foster and strengthen parental participation and partnerships. The parish is the main experience of Church for Catholics and we actively explore ways to engage with the many parishes we serve. 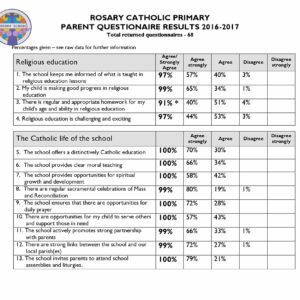 Although we have children from at least seven different parishes the large majority of our families come from St. Dominic’s parish. Fr.Thomas is the parish Priest and Prior and also serves on the governing body. Fr.Nick is our new school chaplain and we are looking forward to working with him in the future. 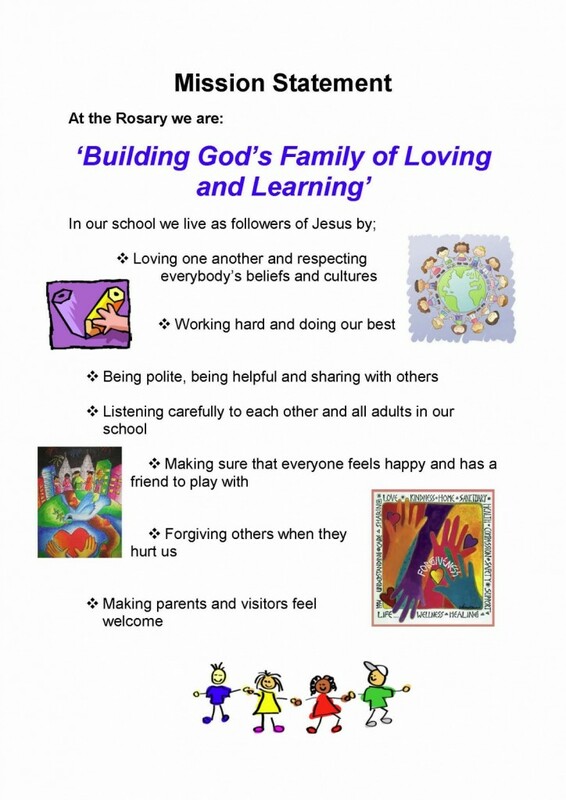 We send the parish newsletter home to every family encouraging non-practising families to re-engage with church. Our vocation is to assist the children on their journey in faith and along the path to true discipleship. We aim to develop children to have open minds and hearts who are inclusive and discerning in their friendships and who have a deep love and faith in Jesus Christ Our Lord.